While mold spores are present everywhere in nature, indoors and outdoors, when mold spores are present and trapped indoors, we feel the negative effects. Respiratory infections, allergic reactions and fatigue are just a few of the conditions that can afflict a person inundated by invisible mold spores. The best basement lighting to prevent the growth and spread of mold is UVC or ultraviolet C lighting, and the knowledge of UVC lighting as an effective mold combatant dates back to the 19th century. Since then, UVC lighting has been used for sterilization purposes in medical centers and in food processing plants. UVC lighting emits ultraviolet light, a band of light rays whose place on the electromagnetic spectrum lies just after the visible violet light band. Light ray wavelengths are measured in units called nanometers, a unit of length equal to one billionth of a meter. Ultraviolet rays have wavelengths that fall between 100 and 400 nanometers Three wavelength groups exist within the ultraviolet group itself: long-wave UVA (315 to 400 NM), medium-wave UVB (280 to 315 NM), and shortwave UVC (200 to 280 NM). It's the shortwave UVC rays that have the ability to prevent mold growth, as well as yeast and virus growth. How? Shortwave UVC rays are capable of breaking through the cell wall of mold strains, and sterilizing the mold cells by changing the structure of its DNA. As a result of DNA alteration, the mold cells die UVC irradiation is used in hospitals, though the level of irradiation that hospital-quality UVC lighting emits--as well as the cost of hospital-quality UVC lighting--makes it impractical for home use. 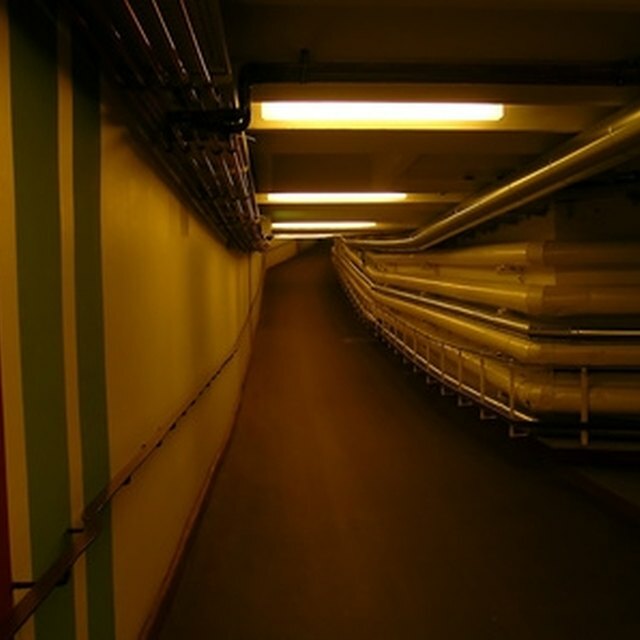 To get the most out of your UVC lighting, the area of the basement in question will need to be adequately cleaned. As effective as UVC lighting is at killing mold cells, the section of your basement will still need to be scrubbed, the same way that an open wound needs to be cleaned and disinfected before being treated If the floor and/or wall area affected by mold is less than 10 square feet, this area can be scrubbed with soapy water and a scrub brush. The area should be rinsed afterward, and fans should be aimed at the washed area to dry it faster. Having a dehumidifier in the washed area is also beneficial. Remember to wear latex or rubber gloves and a respirator while washing. It is not healthy for anyone to breathe in mold spores, regardless of whether they have allergies Areas of mold infestation larger than 10 square feet may need the attention of a mold and mildew removal professional Most UVC lighting designed to fight mold either comes as a tabletop unit or as a long narrow light strip (similar in shape to a multi-outlet power strip). You'll want to place the unit as close to the infested area as possible, aiming rays at the section of the basement you've cleaned and mostly dried. Light-strip UVC units can be fastened to the leg of a chair or table, or suspended from the ceiling of the basement, with bendable wire, and then aimed appropriately. Small, germicidal UVC units for sterilizing toothbrushes can be purchased for as little $10, but the level of UVC lighting output you'll need for basement mold infestation will cost a good deal more. Expect to pay upward of $80 for a quality UVC, tabletop mold inhibitor from a retail department store such as Target. Industrial-strength UVC mold inhibitor units are usually available only from companies that specialize in large air purification units, and these units routinely cost in excess of $250 For effective, budget-minded mold removal of specific areas of a basement, Germ Guardian manufactures a UVC room sanitizer that sits on a base and can be placed right on the floor of your basement in the infested area. Prices range from $120 to $150.